When a flood, tornado or hurricane rips through a community, the wind and water don’t politely dodge the hospitals and other medical facilities in the area. Indeed, natural disasters strike hospitals just as fiercely as other commercial buildings. In fact, the outcome may be even more detrimental because of the potential for infectious diseases to spread. This is why it’s critical to hire a disaster restoration company that’s familiar with healthcare restoration. Why is Infectious Disease Control so Important? The facility must remain up and running throughout the restoration process, if at all possible, to continue providing vital care for patients. When people visit the hospital for treatment of injuries sustained in a disaster, the last thing they want is to catch an infectious disease from liberated spores and pathogens. Construction zones transmit dust and debris into the air, causing health risks for immunocompromised patients, including those with cancer or severe burns. If not properly contained, dust and debris could lead to detrimental or even fatal secondary infections. 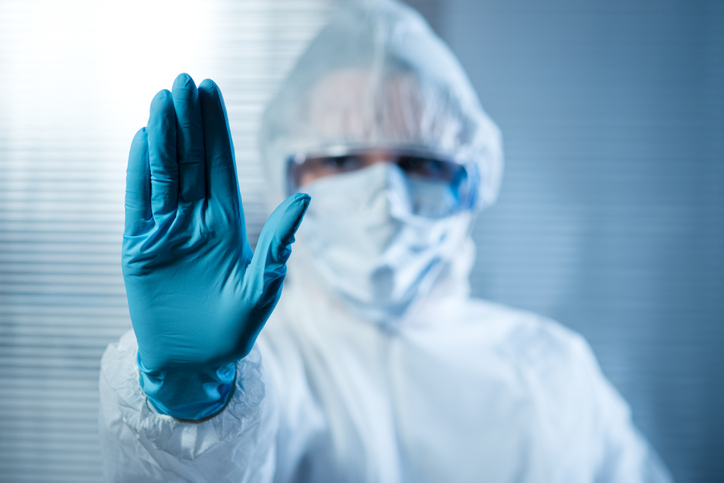 Training: Restoration technicians must recognize the importance of infection control during a project and understand how to implement the proper procedures to reduce health risks for patients and staff. Technicians should undergo Infection Control Risk Assessment (ICRA) training to ensure thorough comprehension of infectious disease control standards. Containment: The Simple Telescopic Airtight Reusable Containment (STARC) system provides temporary, negative pressure containment for technicians working on healthcare restoration projects. This solution is safe, washable, reusable and airtight, making it the ideal construction containment solution. The STARC system is highly praised and utilized in healthcare facilities across the nation. Cleaning and decontamination: Once restoration is complete, a disinfection and decontamination process must take place to restore the worksite back into a fully functioning hospital space. With the proper infectious disease control procedures available from DKI Healthcare Services, you can keep your hospital open after a natural disaster without fear of spreading infectious diseases or causing secondary infections in your patients. Contact us to learn more about the STARC system, our training and effective cleaning and disinfection solutions.